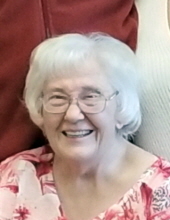 Evelyn “Joyce” Baker , age 82, of Scribner Nebraska died on March 31, 2019 at her residence. Joyce was born on February 23, 1937 to John and Lil Druskis in Omaha, NE and was followed by sisters Lorraine and Carol Sue. She was known to all as Joyce or Joycie. On June 25, 1955 Joyce married Roy Baker. The family grew to 6 with the arrival of 4 children, John, Kathi, Mark and Tom. Joyce was exceptionally family oriented as family was her strength. Nearly every motivation she had was driven by the love to her children. She was involved in every heartache, in which tough love may have appeared, and she wanted to share in the elation in the best of their happiness. If she had nothing else, she had family. Those family members were her jewels. Joyce was a master planner and always saw to it that there were family vacations every year. There were trips to Yellowstone Park, the Black Hills, the Redwood National Park among many other places. She took Mark and Tom rafting the Snake River in Wyoming. She took John (who was in ROTC at the time) to Fort Riley, Kansas when he failed to note the time of the bus departure to her. Trips also included canoeing into the wilderness of Canada, deep sea fishing off the coast of Oregon and a month long vacation that encompassed the western half of the United States. As a family, Joyce organized what rendered hobbyist activities like breeding and showing cavy (guinea pigs) and becoming rock hounds. Among Joyce’s creative talents was quilt making and cake decorating. Throughout the years, she made wedding cakes for many family members weddings. Some were several tiers high and always beautifully decorated. Joyce was a wireman (person) and worked at Western Electric until she and Roy retired in 1991. Upon retirement, they moved to the Branson area and lived there the next 20 years or so. While living there, Joyce began making porcelain dolls. She had done crafts her entire life, but porcelain dolls were her passion. More than just an additional source in income in their retirement years, this hobby produced a small business for a period of years. She was known as the doll lady and even had a newspaper article written about her. She is preceded in death by her parents, John and Lil Druskis, her sister Carol Sue Petrovich and her brother in law, Robert Colby. She is survived by her loving husband, Roy Baker, children John (Harlene) Baker, Kathi Jensen, Mark (Karen) Baker and Tom (Janis) Baker. Also survived by sister Lorraine Colby, 12 grandchildren, Eric (Ashley) Grice, Heather Baker, Cory Baker, Janice (Travis) Bales, Ryan (Annie) Parker, Allyson (Andy) McMurtry, Rick Baker, Courtney (Nicholas) Gobel, Gavin Hilton, John Baker, Harley Baker and Thomas Baker and 10 great grandchildren. Visitation: 4:00 - 8:00 PM Wednesday, April 3, at Dugan Funeral Chapel in Fremont. Funeral Services: 10:00 AM Thursday, April 4, 2019, at Fremont Church of Christ. Pastor J.R. Patterson will be officiating. Burial: Forest Lawn Cemetery in Omaha. To send flowers or a remembrance gift to the family of Evelyn Joyce Baker, please visit our Tribute Store. "Email Address" would like to share the life celebration of Evelyn Joyce Baker. Click on the "link" to go to share a favorite memory or leave a condolence message for the family.